Rev Dr Iain C Barclay was inducted to the Charge of Appin linked with Lismore in Appin parish church on Saturday 5th December. The service of induction was well attended by members of both congregations and of Presbytery, in spite of storms and floods across Argyll. The service was led by the Moderator of Presbytery, Rev Dr Ken Ross. The address was given by Rev Jeff McCormick, who spoke of the importance of the ministry of encouragement, from Acts 11: 19-26. 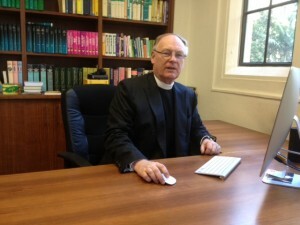 Dr Barclay comes to us from the Scots Kirk in Sydney, part of the Presbyterian Church of Australia. He and his wife Carilon are already known to many in Argyll, from the time when he was Minster in Kyles Church in Cowal. We are very pleased to welcome them both back to ministry in Argyll.